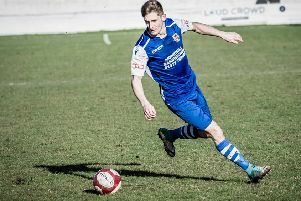 Mikey Dunn, opened the scoring for Pontefract Collieries against Stamford. Pontefract Collieries’ winning start to life in the Evo-Stik League came to an end on Monday when they were edged out 2-1 at home to Stamford. After impressive wins in their first two games in the East Division reality bit as they let a first half lead slip to lose out to a Stamford side boasting a 100 per cent record to sit at the top of the table at this early stage. Colls were looking to quickly erase the memory of another disappointment when they crashed out of the Emirates FA Cup on Saturday and had enough chances to do so, but could not take them on this occasion. Fabian Bailey was back in the side after missing the cup tie and Ponte looked solid in the early stages. They broke the deadlock six minutes before half-time with a fine strike from Mikey Dunn and it was 1-0 at the break. It did not take long for Stamford to get back on level terms after the break as within six minutes Rob Morgan netted after an initial shot by Eliot Putman was blocked and Bradley Fortnam-Tomlinson’s follow up came back off the post. Both sides went for a winner in the remainder of the game, but it was the visitors who came up with it 10 minutes from time as Fortnam-Tomlinson scored. There will be no FA Cup run for Collieries this season as they went out of the competition at their first hurdle with a 4-2 defeat away to Dunstan UTS in Saturday’s preliminary round tie. The Colls faithful travelled in numbers up north to Dunston hoping for another cup run, on the back of a good start in the league and they looked set to continue this when leading with 15 minutes left only for a late turnaround to get their opponents over the line. One change from the win at Pickering in midweek saw Cody Cromack return from suspension to replace the absent Fabian Bailey. Further chances to double the lead followed, but the Dunston keeper stood strong and Jack Greenhough blazed over one opportunity. The home side had chances to equalise and it was surprising that it stayed 1-0 to the interval. It remained an open contest into the second half, but the goals did not come until the last 18 minutes. Dunston equalised through Mark Fitzpatrick, but within three minutes Colls were back ahead as Hey bagged his second of the afternoon. The action continued with the hosts awarded a penalty virtually from the restart and Fitzpatrick put it away to level the game up again. Dunstan then went in front with the fourth goal in seven minutes as Scott Heslop netted. Ponte pushed hard for the equaliser and threw everything at their opponents, but they were caught on the break and knew their fate when Jordan Nellis scored deep into added time to make it 4-2 and seal the cup tie. Pontefract Collieries travel to South Yorkshire as they continue their new Evo-Stik League adventure this Saturday. Craig Parry’s men are away to Sheffield as they aim to bounce back from their first loss at this level and an FA Cup defeat also last weekend. Sheffield have started the season disappointingly with three defeats from their first three matches.